for years now. So its time to build (another) transmitter. most look promising (I'll be using tubes). output will be isolated and have lots of these types of tubes here. Has anyone here built something along there lines? them. Good isolation at the input and output. Let 'em squak! a couple other tubes would be a good starting point. the job too. Will use an xtal controlled osc. Time to play! BTW if you have TV RF amp triodes on hand(6FQ5, 6HA5, etc) I have a good circuit that uses them as AF preamp.. Unfortunately PhotoBucket has deprived us of the schematic and instruction sheet for Norm's transmitter that were posted in that thread. Are those available anywhere else online? I've decided on an original design. the xtal oscillator driving the other which will be a class C amp (PA). network to whatever antenna is connected. schematic if its a worthy design. True VU meters and, in general, VU-type meters, are quasi-peak devices that cannot display some of the fast peaks responsible for overmodulation. That is why broadcast modulation monitors demodulate the transmitted signal and use flashers driven by peak-detection circuits to display peak modulation. When setting up your transmitter I would suggest looking at your signal with a 'scope and a variety of modulation to determine what maximum VU-type meter reading will prevent carrier pinch-off. 100%. The meter I'm using is the same one used in the HP8640. to drive the meter so I can set the delay to a resonable level. So its not really a VU meter. with most designs I've looked at. Suprised other low power AM BCB transmitters people have built don't have a mod indicator of some sort. Most of the designs that I have seen, and most built and sold back in the day as wireless phono preamps, use directly modulated oscillators, and those cannot be modulated beyond about 30% before generating significant envelope distortion and other artifacts. The same is true of external modulation of service-grade signal generators using directly modulated oscillators. I am tempted to build the 6888 transmitter just to see how it specs with my commercial AM modulation monitor and distortion analyzer. 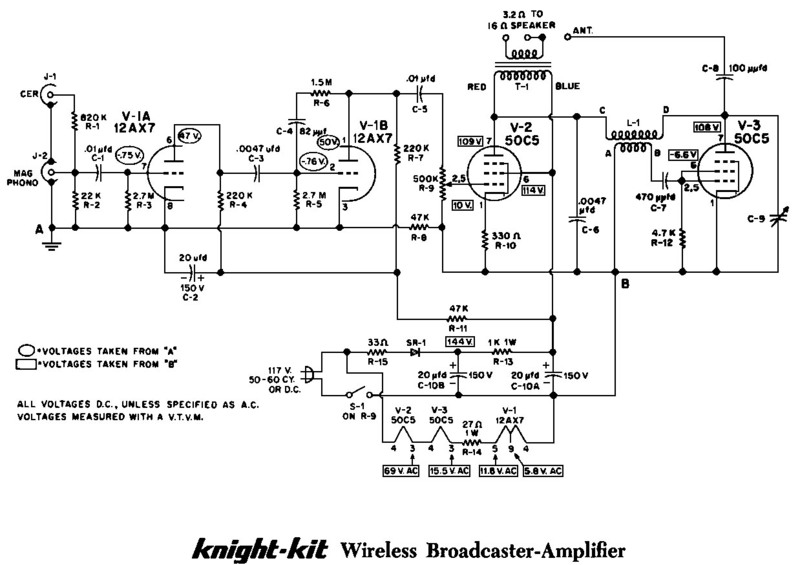 your 50C5 idea sounds somewhat like the old Knightkit "Broadcaster." +1, this kind of testing is something I'd really like to see. I'd do it myself but don't yet have the equipment to do a really good job of it. I want to see something supported by measurements instead of just "sounds good on my Belfonic 3-transistor radio". Some of us here have really good AM radios that call for a quality source. Absent test results to the contrary I remain skeptical of the signal quality from the types of transmitters that get the most attention on this forum. I also wonder how many of these tube type transmitters comply with the Part 15.219 input power limit. Although it's somewhat moot if the signal is within 15.209 limits anyway which only concern field strength. Theoretically one could run 100W into a dummy load as long as the signal doesn't get out far enough. Something I forgot... It's more important to prevent modulation from going below 0% than exceeding 100%. If I was going to add an LED circuit I would have it turn on when modulation gets close to the 0% point. A bit of signal past 100% isn't a real big deal, but completely cutting off the carrier is. Thank you so very much for the clue. I also wonder how many of these tube type transmitters comply with the Part 15.219 input power limit. I would think very few - how many do you see equipped with meters to measure the DC voltage and current in the final stage? Although it's somewhat moot if the signal is within 15.209 limits anyway which only concern field strength. A transmitter meeting 15.219 should meet 15.209, though I have not tried measuring one (I do have access to a Field Intensity Meter at work). Theoretically one could run 100W into a dummy load as long as the signal doesn't get out far enough. I would think that Enforcement Bureau would say otherwise - the general rule is that operation into a dummy load is for testing and maintenance. Keeping the modulation within limits is definitely an important concern. I initially found it very difficult to get good results, because of the widely varying levels between different program material. It meant constantly readjusting the input level or else permanently setting it to a very low level to prevent over modulation. However, setting to a low level is a poor solution. Many people who feed their transmitters with computer audio, also use audio software that provides limiting and compression. I eventually came up with a different solution: a controlled carrier transmitter circuit that is very resistant to over modulation. On sudden audio peaks, the carrier level just goes up to handle the transient audio. Average modulation is over 100%. I also made a simple mod to Norm's 6888 transmitter to convert it to controlled carrier. It only requires a diode, a capacitor and two resistors. As for concerns about going below 0% modulation (i.e., negative modulation), this can only happen with a balanced modulator circuit. Neither the tube transmitter circuits nor the LM386 circuit mentioned here use a balanced modulator. So, this is not an issue. I have read stories on several Part 15 AM forums where the FCC tried to cite certain part 15.219 AM transmitter installations for being above the allowed field strength under 15.209. Once the FCC inspector found out the transmitter was indeed compliant with 15.219 they backed off. Apparently with a well designed and constructed antenna system and favorable ground conductivity it is possible to get a mile or more usable range from a 15.219 compliant transmitter/antenna system which is above the allowed "about 200 foot" range you'd get under 15.209 field strength rules. I'll defer to your knowledge about dummy load rules. It'd be pretty stupid to run that kind of power and turn it into heat. The point I was trying to make is as long as the field strength is within limits it really doesn't matter what the transmitter power is. From what I understand, 15.219 rules were given as an simpler to measure alternative to making measurements with an expensive calibrated field strength meter, at least for the AM broadcast band.